I always end up buying fruits and almost forgetting about them till they are ripe and need urgent attention. 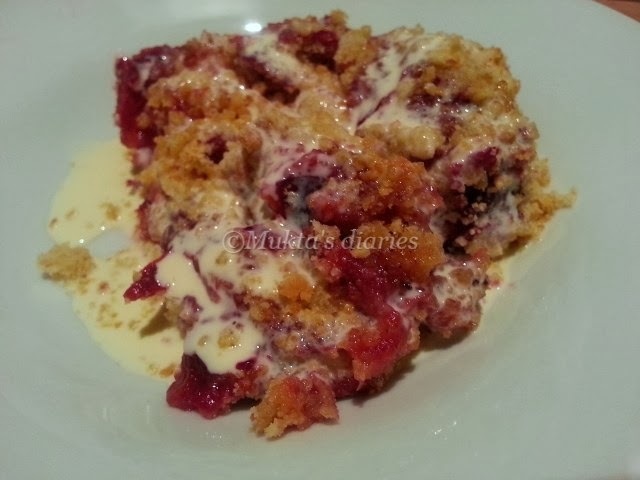 I was wondering what to do with so many ripe plums that were in the fruit bowl and thought of a plum crumble. Preheat the oven to 200C/180C fan oven. Place the halved plums in a shallow baking dish. Mix together the ingredients (not the crumble ingredients) - flour, ground almonds, cinnamon, ginger and demerara sugar together and sprinkle on top of the plums. Mix in the crumble ingredients together gently using the tips of your fingers or put them in a food processor. Make sure not to over process. The mixture should retain a crumbly texture. Scatter on top of the plums to cover all the plums. 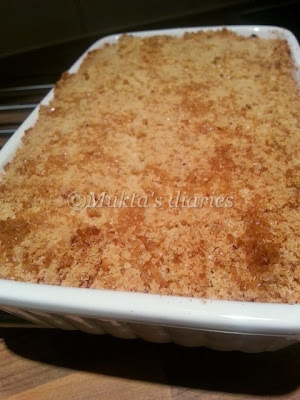 Sprinkle some demerara sugar on top of the crumble mixture. Bake in the oven for 25-30 minutes. Leave to cool slightly ( 10 minutes). Serve with cream.